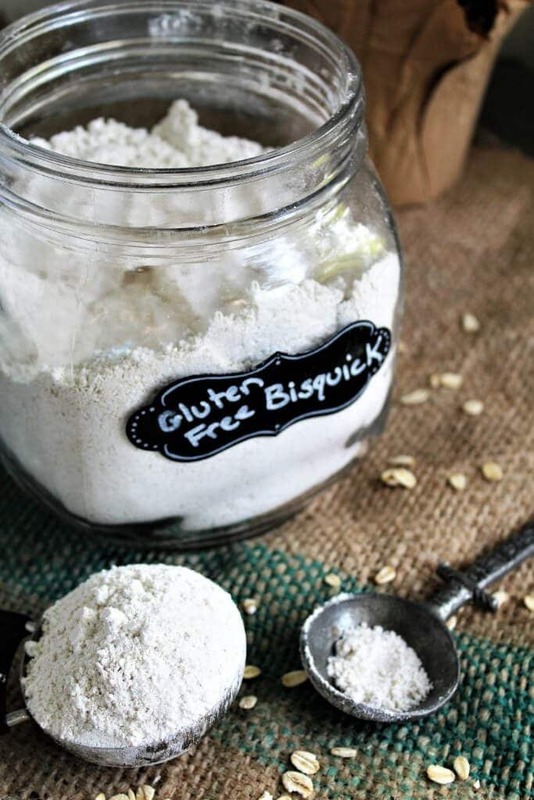 This homemade gluten free Bisquick recipe is quick, easy, and delicious! It’s gluten free of course, vegan, and made with only a few simple ingredients. You can use it as a 1:1 replacement for Bisquick in almost any recipe! It’s made mostly with healthy whole grain oats! 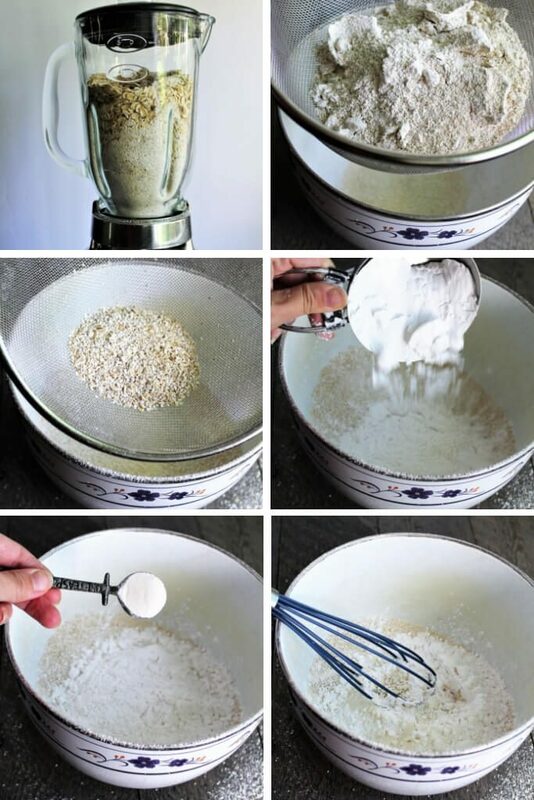 You can easily grind your own gluten free oats into flour, so they don’t lose nutrients sitting on the shelf. It makes the best gluten free Biscuits that you’ll ever taste! You can make as much or as little as you need. You’ll never have to buy expensive gluten free Bisquick type mixes again! It has a similar protein content to wheat flour, so it bakes up similar to wheat flour. What’s in Gluten Free Bisquick? Oat flour – Made easily by simply grinding oats in your blender. Tapioca flour – for a smooth texture that binds and stretches. Xanthan gum – as a binder. Baking powder – to make it rise. 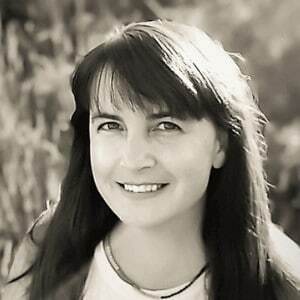 How do I make my own gluten free Bisquick? Put gluten free whole oats into a blender. Blend for about 1 minute until the oats have turned into flour. Pour into wire mesh strainer or a flour sifter and sift over a large bowl until all the fine flour has fallen through. (Throw away the large pieces of bran that are left in the strainer). Add tapioca flour, xanthan gum, baking powder and salt to the oat flour and then give it a good stir. That’s it! You have just made your own gluten free Bisquick that you can use in place of traditional Bisquick in any of your favorite recipes! Note: I have noticed that recipes occasionally require slightly more liquid when using this gluten free Bisquick. Some varieties of Bisquick are vegan like the Heart Smart or Gluten Free Bisquick. The buttermilk varieties are not vegan. This homemade Bisquick recipe is vegan however! What recipes can I make with this gluten free Bisquick mix? This Bisquick makes delicious gluten free biscuits, pancakes or short cake! Anything that you make with Bisquick can be swapped for this recipe to make it gluten free! My family’s absolute favorite recipe to make with this Bisquick are these Vegan Cheddar Bay Red Lobster Biscuits! They are simply amazing when made with this homemade Bisquick! Make easy gluten free Bisquick pancakes too! Try this pancake recipe from Kelsey Smith for fluffy gluten free vegan pancakes! Did you make this gluten free Bisquick mix? Leave a comment and let us know what you made with it! 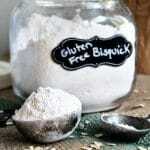 A simple yet healthy recipe for homemade gluten free Bisquick to use as a Bisquick replacement in any recipe. Put 1 3/4 cup of gluten free whole oats into a blender and blend for about 1 minute until the oats have turned into flour. Store in an air tight container until you are ready to use it as you would Bisquick. I have noticed that recipes occasionally require slightly more liquid when using this gluten free Bisquick. Make sure to mix it up well so you have the proportions evenly distributed within the mix. Wondering about adding shortening. Most bisquick and diy bisquick has shortening in the mix (use spectra for vegan). I used this bisquick to make gluten free biscuits, they came out so much better than when I make them with the regular gluten free stuff that I get at the store. I love that it used whole grain oats too and not just a bunch of bleached milled grains! Thanks so much for this great recipe!